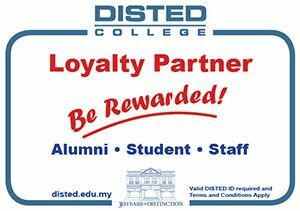 The following offers are available to DISTED’s students, staff and alumni. Please show your valid DISTED ID card before you make an order or request. 3 Kimberley Hotel Georgetown, No36, G-02, Jalan Sungai Ujong, 10100 Georgetown Penang. 15% off on total bill for lunch & dinner at YEAR Long. RM10 off per room night on hotel room rate via hotel online booking at hotel’s website. Buy 2 get 1 Free promotion on every Friday from 12pm – 3pm for set meal. A la carte – 10% off + RM1 unlimited refill drinks. Combo meal on weekdays – RM12.5% off. Combo meal from 12pm-5pm on weekdays – 12.5% off + 5% off. Discount & Promo only available for Student and Staff. One student/staff ID is entitled for One type of promotion per day. 10% discount for ala carte menu. Discount is not valid for promotions and set meal include below items of normal noodle and minced pork rice & yong to fu in soup. Discount is not valid for promotional items and alcoholic drinks and also not applicable on weekends. Eligible only when there’s a min. spend of RM30+ per pax. 10% discount off for ala carte menu. Discount is not valid for promotional items and set menu. Discount is only applicable for Penang outlets (Queensbay Mall and Prima Tanjung). The information presented on this webpage has been provided to DISTED by the organisations listing their products and/or services. DISTED is not responsible for the content of this information and gives no warranties in relation to its accuracy or completeness. DISTED does not accept responsibility for any loss or damage occasioned by use of or reliance on the information presented on this webpage or on any linked external website.